Children have a natural affinity for language play; Pyrotechnics on the Page demonstrates how writing teachers can tap into it. This book provides a wealth of resources for teachers, including information on the roots and developmental importance of language play, a how-to on using the writer’s notebook as a playground for students to explore and experiment with verbal pyrotechnics, an in-depth look at the kind of language play commonly used by writers, twenty-four brand new craft lessons to bring pyrotechnics into the classroom, and an extensive bibliography of relevant mentor texts. 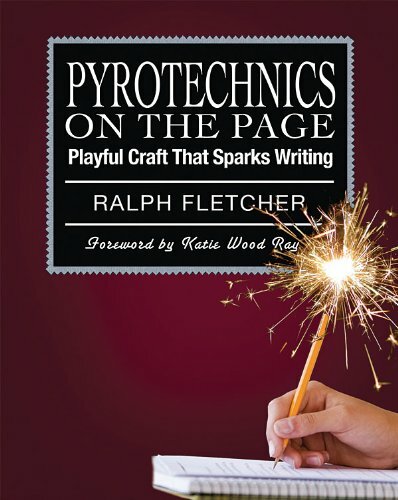 Pyrotechnics on the Page is vintage Fletcher: personal, anecdotal, and practical. Bring back the fun in teaching writing! I bought this as soon as it came out since I trust Ralph Fletcher as a writer and as a teacher. But I had no idea I would have so much fun reading it. I started trying the experiments in my notebook and weaving them into my thinking for fall before I was out of the first few chapters. I can't wait to try these with students! The author makes the dissection of popular culture readable, engaging and thought provoking. My only gripe is, where's the tenth anniversary edition?We need an update!Please! Normally, I'd be a bit wary of anyone whose job title was "cultural critic." I'd imagine such a person to be a bit insular and pretentious, prone to throwing around terms like "Hegelian" and "hermeneutics" without due cause. But that stereotype has been exploded for me recently, as I've found myself in hog heaven devouring the essays of New York University journalism professor (and yes, cultural critic) Mark Dery. An excellent sampling of his work can be found in this book. 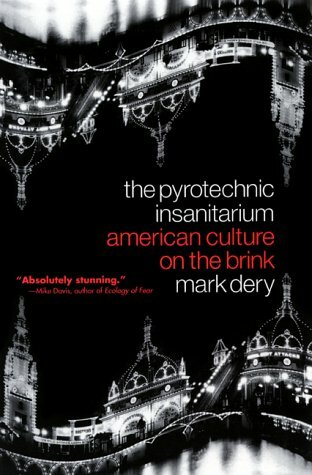 "The Pyrotechnic Insanitarium" is a collection of essays about "fin de millennium" America, tackling subjects as diverse as the Unabomber, the Home Shopping Network, artist Damien Hirst, and the city of Celebration, Florida (a kind of company town or planned community run by the Disney corporation). I assumed that the book's title was a `90s-hipster turn of phrase for how crazy things were back when the millennium was approaching. But it's actually a term applied to Coney Island at the very beginning of the 20th century. Dery uses Coney Island as a metaphor for the centrifugal force and adrenaline rush of a culture on the edge of an abyss. As he points out in the book, we've never _not_ been living on that edge--people throughout history have believed that they were surviving in end times, though the nature of the perceived upcoming apocalypse has varied from place to place and era to era. What makes Dery's writing so extraordinary is a little hard to pin down. He's brilliant, and it's hilarious, and the well-turned phrases abound. But I think it's also the rare combo of cynicism and affection with which he approaches his topics. Whether he's writing about the perils of knee-jerk masculinity or about the bizarre cultural contradictions of Taco Bell, he honors his chosen subjects with true attention, rather than going for cheap shots or heading down the snarkiness waterslide. Dery writes a lot about the body, about how our relationships to our bodies are changing as we live more and more online, more digitally and virtually. There's an aggressive curiosity to his work that gives it more of an edge than that of other essayists I admire, such as Malcolm Gladwell (with whom Dery sat on a Time Magazine panel about the future a few years back). I get the sense that Dery was online before mainstream America knew what the Internet was, and that he would agree with William Gibson that "The future's already here, it's just not evenly distributed." Reading a Dery essay feels like having a few drinks with a really smart friend who wants to regale you about all this incredibly cool stuff he's been thinking about--not out of any pretentious urge to prove his brainpower, but just because thinking is fun, and expressing our thoughts to others even more so. The elegance, wit, and impoliteness of Dery's writing make "The Pyrotechnic Insanitarium" relevant and challenging, even a full decade after its publication. Time and again I turn to the writing of Mark Dery for inspiration and illumination. The cleverest cultural critic to have spurted out of Uncle Sam's loins, Dery's roving, voracious, ferocious eye outs the dasein of these fine United States with a delicious jeremiad that entertains even as it horrifies.The other day I was trying to sort out how to address the growing phenomena of SCARFACE paraphernalia that is exploding in sales across the Texas-Mexican border. I returned to the pages of Pyrotechnic Insanitarium--the lucid paragraphs on the ubiquity of Edvard Munch's HOWL image-trope in the global visual economy. I remember being at Cornell back in the day and reading/teaching "Culture Jamming: Hacking, Slashing, and Sniping in the Empire of Signs: Pamphlet #25" in my second class as a TA in Comparative Literature. THE PYROTECHNIC INSANITARIUM reveals a writer even more on top of his game.Take Gore Vidal, Susan Sontag, JG Ballard, and mix in a little Helmut Newton and Lupe Vélez, and you the get the mind and prose of the one and only Mark Dery. Dery's initial metaphor--Coney Island as controlled chaos, an irruption of social taboos--sets the theme for this collection of essays exploring the finde millenium American turn toward the countercultural, the outcast,the obscene,the pacifying. Exploring the place of Disney, talk radio andtelevision, technology, Heaven's Gate, the Unabomber, aberrant art, freakculture, carnival celebrations and other social expressions beyond thepale, Dery suggests that in the century since Coney, America continues toindulge the dark and the chaotic, but it does so now in tones suggestingresignation more than despair. Suggesting a dialectic reaction, Dery positsthe angst of postmodern American as a response to the loss of meaning andcontrol that pervades its society. Gated communities attempt to carve outislands of control amidst urban terror; Disney offers a world whosesimplicity and comfort counter the misshapen reality about us; all thewhile underground art movements aggressively mock corporate values. And forgood measure,Dery is a scintillating writer, tossing off well-turnedphrases and allusions that both entertain and clarify. A stimulatingcompilation of writings. I heard Dery interivewed on KPFK in Los Angeles, and wondered if he was as gleefully subversive,jarringly insightful and downright hilarious in print.I wasn't disappointed!Imagine a brains-sloshing rollercoaster ride where your IQ is ten points higher--rather than lower--when youdisembark.That's what you're in for. When Chinese alchemists fashioned the first manmade explosion sometime during the tenth century, no one could have foreseen its full revolutionary potential. Invented to frighten evil spirits rather than fuel guns or bombs-neither of which had been thought of yet-their simple mixture of saltpeter, sulfur, and charcoal went on to make the modern world possible. As word of its explosive properties spread from Asia to Europe, from pyrotechnics to battleships, it paved the way for Western exploration, hastened the end of feudalism and the rise of the nation state, and greased the wheels of the Industrial Revolution. This is a quick and engaging read and should be regarded as being more for entertainment than education. Anyone who has any prior knowledge on the subject will likely not get a whole lot out of it. My main issue with this book is the condescending nature with which the author regards previous eras. The author's bias serves only to perpetuate the degrading stereotypes that shape the many misconceptions of bygone centuries. I would say it's worth reading, has a sound structure, and quick pace, but lacks the detail and point of view that the subject matter demands. This is an excellent publication and highlights how gunpowder changed world history and is also a fascinating insight into how gunpowder was developed and why no-one knew quite why it worked for 500 years after it was invented. Okay, I'm a nerd.No question.Do you have to be a nerd to love this book: probably.But, if you are a nerd... oooohhh.. you're in for a treat!The history of gunpowder is several thousand years of unlikely,gradual and fascinating improvements. This book turned out to be far more interesting that what I expected. It makes a very good case for the argument that gunpowder is one of the most important inventions in history - and you may in fact walk away with the conclusion that it is in fact THE most important. Concise, eloquent, and engaging. Highly recommended. I read 'Gunpowder' some time ago which, in some cases, is the best way to review a book.Smooth writing and catchy phrases usually disappear from the mind after a day or two, more important concepts last longer.Kelly's book is more informational than a page-turner.His basic premise that the invention of gunpowder--no matter who actually invented it--was one of those pivotal discoveries that changed history inexorably and for all time, stands as a certain truth. Perhaps like other pivotal discoveries--fire, the chipped stone handaxe, the atlatl, the bow and arrow, the shovel, the wheel, the screw and many, many others, the discoveror [s] have disappeared in history.Still, it was discovered, probably quite by accident, and we are all both its beneficiaries and victims.Kelly did a good job of emphasizing something that all of us should have known anyway...but didn't. Fireworks are synonymous with celebration in the twenty-first century. But pyrotechnics—in the form of rockets, crackers, wheels, and bombs—have exploded in sparks and noise to delight audiences in Europe ever since the Renaissance. Here, Simon Werrett shows that, far from being only a means of entertainment, fireworks helped foster advances in natural philosophy, chemistry, mathematics, and many other branches of the sciences. Fireworks brings to vibrant life the many artful practices of pyrotechnicians, as well as the elegant compositions of the architects, poets, painters, and musicians they inspired. At the same time, it uncovers the dynamic relationships that developed between the many artists and scientists who produced pyrotechnics. In so doing, the book demonstrates the critical role that pyrotechnics played in the development of physics, astronomy, chemistry and physiology, meteorology, and electrical science. 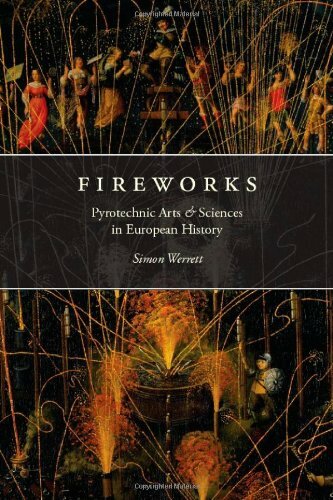 Richly illustrated and drawing on a wide range of new sources, Fireworks takes readers back to a world where pyrotechnics were both divine and magical and reveals for the first time their vital contribution to the modernization of European ideas. At first I thought it was overpriced, but take a look and compare any technical book with packed with this much information.There's tons of information to digest and make notes on.Whether you're interested in pyrotechnics, understanding the chemistry of different compounds to use in rocket motors or fireworks.It's not meant as a how-to on either but the understanding of why certain chemicals are or are not mixed together, how they react in different ways.It will hopefully help you to be careful if you attempt anything along these lines.I for one glad I bought it and would have paid more now that I know how much information is in it. As others seems not to have understand : it's a REPRINT . This book was originaly printed in 1974 thats why it may seems a bit outdated. However still very interesting for beginners. Authored by an insider with over 40 years of high energy materials (HEMs) experience in academia, industry and defence organizations, this handbook and ready reference covers all important HEMs from the 1950s to the present with their respective properties and intended purposes. Written at an attainable level for professionals, engineers and technicians alike, the book provides a comprehensive view of the current status and suggests further directions for research and development. An introductory chapter on the chemical and thermodynamic basics allows the reader to become acquainted with the fundamental features of explosives, before moving on to the important safety aspects in processing, handling, transportation and storage of high energy materials. With its collation of results and formulation strategies hitherto scattered in the literature, this should be on the shelf of every HEM researcher and developer. George Washington Weingart worked in and observed the fireworks manufacturing industry during its heyday around WWI. He gives good, practical instructions for making physical components, but the compositioninformation is often inaccurate, plagiarized from patent information, orotherwise questionable. Weingart does not document his sources. However, itis a very good introductory text within its limitations. Best to check moremodern references as well before relying on this one though. 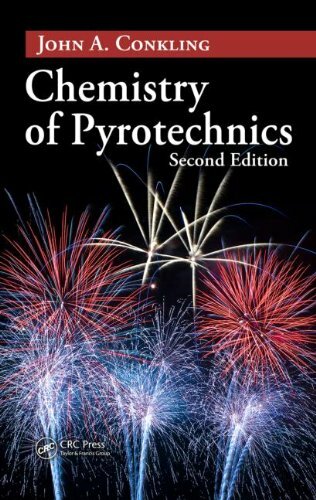 Chemistry of Pyrotechnics: Second Edition is simply the most definitive reference in this field. Author J.A. Conkling covers the requisite background in chemistry, thermodynamics, and light emission; introduces oxidizing agents, fuels, binders, and retardants; and then explores virtually every aspect of formulating pyrotechnics. Topics include the requirements for and preparation of high-energy mixtures, ignition and propagation, heat and delay compositions, and color and light production, including sparks, flitter, and glitter. The journal Pyrotechnica said this book "…belongs on every pyrotechnist's bookshelf." From veteran author Jack Kelly, a tour through the turbulent history of one of mankind's most critical inventions-the fiery substance that transformed everything from fireworks in China to warfare in Renaissance Europe and beyond. My search for information was to document the history of gunpowder throughout the Civil War. Exactly how did the Union and Confederates get their gunpowder? This breakdown begins well before the Civil War, but includes the Civil War in great detail. I found the book to be very historically correct and factual. It ties all of the pieces of the puzzle together, yet explains each piece individually. You have to step back to put the chronological order together because so many actions were taking place at the same time. If you are looking for the history of gunpowder and how it interacted with time, the answers are in this reading. Jack Kelly outlines the development of gunpowder and its impact on history, giving us a fascinating tour of warfare over the centuries.Always instructive, at times the text veers to the literary, no mean feat in a work of this kind.Tracing its earliest use in China to use in hundreds of years of European wars to the American Revolution and the Civil War, Kelly stitches together historical vignettes that are relevant and interesting.The book is written as a "popular account of gunpowder" and not as a scholarly work, but the author includes a list of a number of sources for those would delve deeper. Well worth your time and money if you want a deeper insight as to how gunpowder has influenced history. Fun (really!) popular history of gunpowder, which started and ended its career as a propellant for fireworks, and in between fueled wars between men and nations, at land and sea. 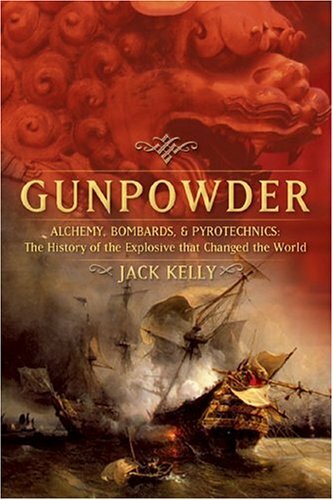 One interesting point made by Kelly is that gunpowder was an early human technology that was developed and refined by practitioners, who had an imperfect understanding of how it worked, and not theoreticians, who often had NO understanding of how it worked.And in fact gunpowder as a technology was superseded before science fully caught up with it, so that it is still to some extent an unknown quantity. I am reminded of Jimmy Buffett's line "A bombardier, a nighttime magician" in reference to a fireworks artisan setting of a show. It didn't take long for me to realize this history book was more about telling a story than it was a reference book.Kelly's description of fire and how man could manipulate it to make explosions let me know that this would be an entertaining read.It was.And, that was just the prologue. I found myself engrossed in his story of how Black powder was born and progressed through history much like a man ages.Developing from an entertaining infant (Oriental fireworks), to an influential adult (as a strategic commodity that changed governments, national borders, and economies) then again as an old man, replaced by today's high explosives, serving predominantly to entertain his grandchildren (today's modern fireworks). I am a chemist with over 20 years experience working with explosives.I still found this book entertaining and educational.As I read, I dog-eared multiple pages and underlined passage after passage of rich descriptions of chemical processes, mechanical processes, and historical observations (in a lifetime of studying and teaching chemistry I knew of the important contributions made by Antoine-Laurent Lavoisier; but, I didn't know the role explosives played in his life and death). In addition to explosives enthusiasts, the book should be read everyone with an interest in the Revolutionary War or the Civil War.Their understanding of those conflicts will be incomplete without understanding the tactical and practical impacts of GUNPOWDER. 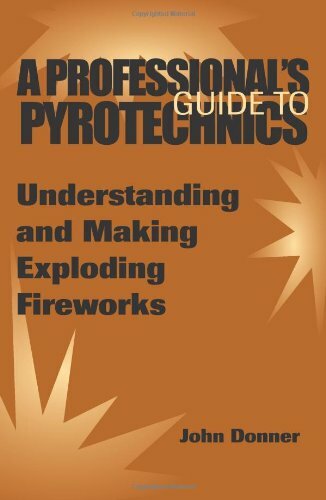 A Professional's Guide to Pyrotechnics is everything a novice or a professional would desire. There are several explanations about how to build different fire crackers as well as interesting facts about the history of each firework. 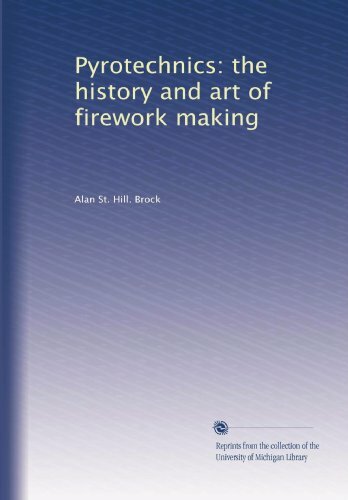 The book does a good job of explaining safety procedures and rules for making fireworks. I really enjoyed working with this small but useful book. 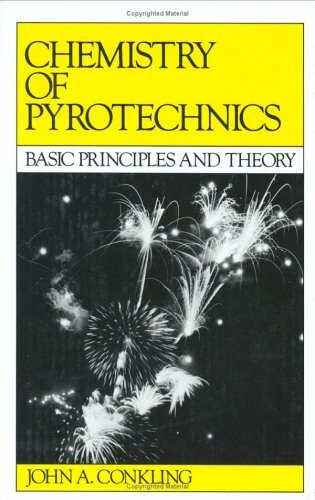 This book does a good job of filling the "holes" that at least the newer editions of "firework classics" such as Fireworks Principles and Practice have in them when it comes to exploding fireworks (noisemakers).Oddly enough Amazon offered this book when I was purchaseing Fireworks Principles and Practice.The author here is very big on safety. I think this book makes a very good addition to the classic Fworks by Lancaster especically seeing as how the latest edtion of that work has a poo-poo atttitude to noisemakers and exploding fworks.Otherwise it too is an excellent book and it is easy to see why it has gone on to a 3rd editon. I was hoping for more information on creating color in fireworks, but this was a great place to start. great for the 4th, im using it for July4th '08!!! The content does not live up to the title. 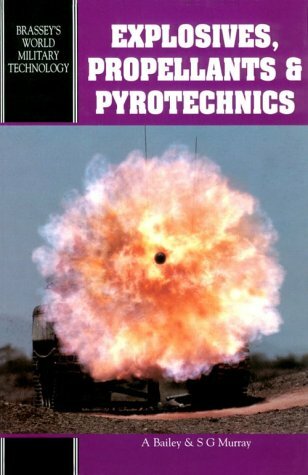 Having more than a dozen years in dealing with explosives safety, I must state that this is by far one of the best books I've read in dealing with Explosives, Propellants & Pyrotechnics.This book not only covers the basics, but actually goes into enough detail to keep even the most knowledgable persons interest. This book has the best modern general treatment of the field of any in my possession or knowledge. I have numerous other authors works, such as Ellern, Shimizu, Lancaster, Tenney Davis & etc. This one is the first one I turn to. This book IS NOT intended as a "how to" manual for amateur fireworks makers, which is apparently the beef of another reviewer here. It is a broad treatment of the entire subject of both civil and military pyrotechnics, with an emphasis on materials and theory from which a lay person may take a broad understanding or a knowledgeable pyrotechnist may take working principals from which to begin experimentation. A Hobbyist point of view. From a Fireworks-Hobbyist point of view, I am very disappointed, having high expectations from this 2001 publication, expecting maybe something more up to date. There are several references of "Weingart (1947) and Shimizu (1980-96)" formulations with at best vague descriptions of "how-to", referring the reader to their books for a more complete and detailed version. Rather get Shimizu's book and have the complete version to begin with not some small incomplete abstract of it, and the same goes for almost all the other references. On the up-side, I see this book as the great book of little abstracts loaded with historical interests, teaching you the Japanese words for different firework devices...that is if that's your interest. Bonnie Kosanke can't very well pan her hubby's book, so I will!Seriously, the book has some good articles- But you could buy a copy of Alexander Hardt's Pyrotechnics for that ammount of money and have a better book if you're only buying one pyrotechnics book this year. John R. Steinberg, M. D. [Originally appeared in "Journal of Pyrotechnics", No. 21, Summer, 2005. 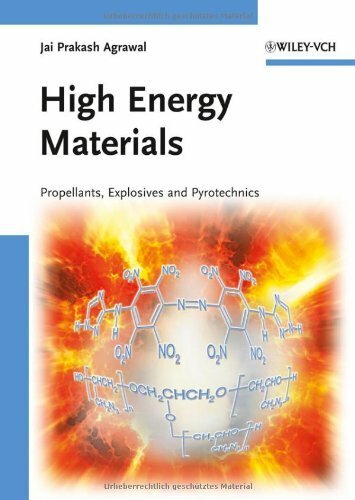 This is a collaborative work by many authors, resulting in many distinct writing styles between the various chapters; nevertheless the book provides a superb overview of the chemistry of pyrotechnics and various tangentially related topics. Given the stellar curricula vitae of the contributors, it is no surprise that this work is both technically excellent and extremely interesting to anyone with any degree of curiosity regarding pyrotechnic chemistry. While the preface discloses that this text is written at "an introductory to intermediate level" the more extensive one's background in the field, the greater the appreciation for the material will be. It is, indeed, as promised, accessible to both novices and appreciated by fairly advanced students of this subject. The book consists of nineteen chapters and is extensively, if not exhaustively referenced, providing a guide to further source material for those readers desirous of more advanced treatments of the various topics discussed in each chapter. The first chapter, an Introduction, by David Dillehay, provides a brief history of both pyrotechnics and other energetic materials. It offers both background information and definitions. The eminent Takeo Shimizu wrote the second chapter, which discusses the Chemical Components of fireworks. More than simply a list, Shimizu provides a practically focused "chemical handbook" of the compounds' chemical and physical properties, the history of their use and the applications for each, as well as a brief introduction to the types of chemical reactions in which these materials are used. Barry Sturman, in Chapter Three, provides an Introduction to Chemical Thermodynamics. This chapter is, of necessity, more technical, though the author successfully avoids making the material so abstruse as to be useful to only the expert. 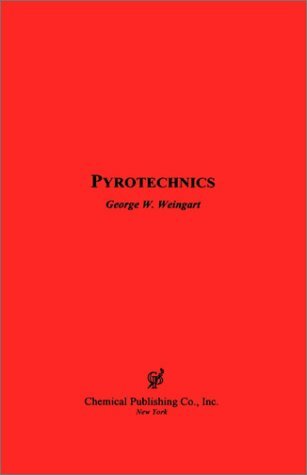 Ken and Bonnie Kosanke contribute the Fourth Chapter on Pyrotechnic Ignition and Propagation and Chapter Five on Control of Pyrotechnic Burn Rate. The fourth chapter is a very interesting treatment of a topic more often assumed to be understood than actually understood. 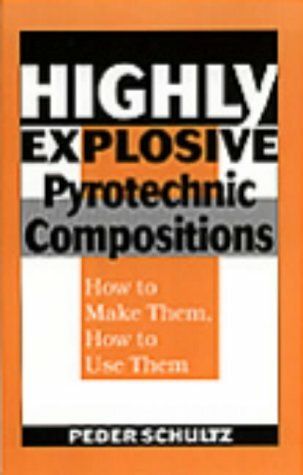 The fifth chapter provides a very practical approach to pyrotechnic problem solving and explains why compositions behave in the manner that they do. Ian von Maltitz contributes Chapter Six on Black Powder. No discussion of pyrotechnic chemistry could be considered complete without addressing, in detail, this most seminal pyrotechnic composition. Chapter Seven, by the Kosankes, discusses Pyrotechnic Primes and Priming. Many an excellent star has been "blown blind" for failure to provide an adequate prime. Mike Wilson and Ron Hancox contributed Chapter Eight on Pyrotechnic Delays and Thermal Sources. 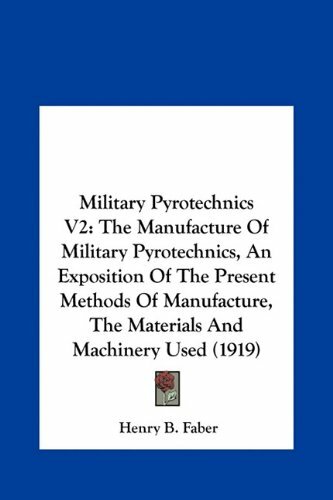 This technical material may be of less direct use to most pyrotechnists, but, the discussion of this topic is both well written and serves to expand the reader's knowledge of this subject. The Chemistry of Colored Flames, Chapter Nine, is written by the Kosankes. 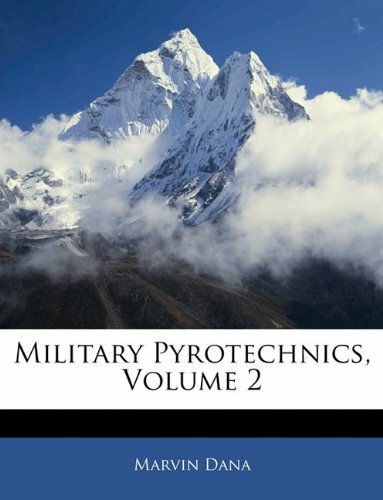 This critically useful material begins with a brief discussion of the physics of visible light and proceeds to apply this basic material to a very detailed and cogent discussion of the basics of producing pyrotechnic colored flames. a most useful chapter and greatly enhances the value of this textbook. Chapter Ten on Illuminants, by Dillehay, naturally follows. Again, this material is of less direct application for many pyrotechnists, but nevertheless provides a useful treatment of the subject of pyrotechnic flashes, flares, and illuminants, often used to good effect in displays. Propellant Chemistry by Naminosuke Kubota is the subject of Chapter Eleven. Composite propellants and Black Powder propellants are discussed. Combustion kinetics and chemistry are then reviewed. Kubota's Chapter Twelve, Principles of Solid Rocket Motor Design, is, in and of itself, practically a monograph on this subject. This chapter can be read at either of two levels: the reader conversant with physics will be provided sufficiently detailed technical information to apply the material provided to designs of independently conceived rocket motor systems, while the amateur will still be able to read the chapter to gain an understanding of exactly how rocket motors are designed and how they function. Chapter Thirteen, by the Kosankes and by Clive Jennings-White, on Pyrotechnic Spark Generation provides an articulate discussion of a topic as important as colored flames. Strobe Chemistry is the subject of Chapter Fifteen, also by Jennings-White. Again, this is an easy effect to compound and to produce and a rather difficult topic to understand in detail. Whistle Devices provide the topic for discussion in Chapter Sixteen, by Mike Podlesak and Mike Wilson. Whistle combustion chemistry is reviewed in a manner at once extremely technical and fascinating to almost any reader. From a safety perspective, there is, perhaps no more vital topic than that discussed by Dave Chapman in Chapter Seventeen: the Sensitiveness of Pyrotechnic Compositions. Tests for sensitivity and a discussion of the different nature of friction, impact, and temperature sensitivity are discussed. Clive Jennings-White and Ken Kosanke review Hazardous Chemical Combinations in Chapter Eighteen. The authors provide a detailed discussion of dangerous chemical combinations, discussions of the hazards produced, and a basic chemical rationale for why these particular compositions are so hazardous. Tom Smith's concluding Chapter Nineteen, on Assessing the Risks, provides a safety-oriented and practical approach to those contemplating working with pyrotechnic compositions and devices. Overall, this is a most satisfactory endeavor. 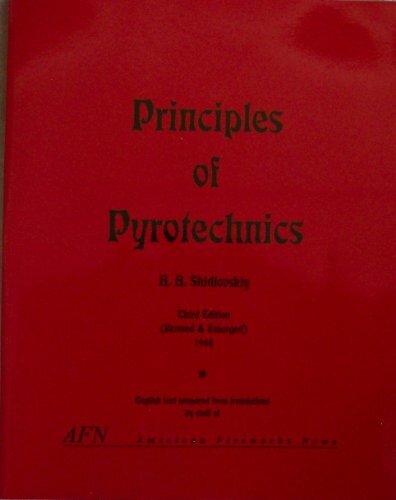 The Pyrotechnic Chemistry textbook offered by these authors through the Journal of Pyrotechnics is at once useful and fascinating. Its various topics differ in degree of complexity and will appeal to a wide range of readers. 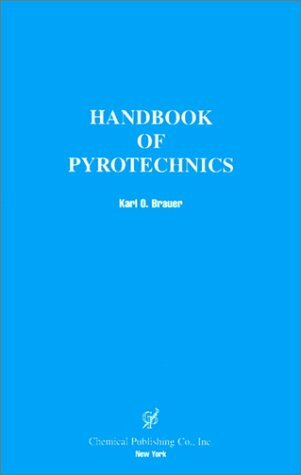 While no single textbook can completely cover this broad range of associated and collected topics, this reviewer feels that the Pyrotechnic Chemistry book is an excellent basic and reference text (thanks to its exhaustive bibliography) and is worthy of inclusion in any reader's pyrotechnic library. I enthusiastically recommend this book and offer my congratulations to its contributing authors and editors on a job well done.